Kaitlin Daddona is a student and member of the Air Force Reserve Officer Training Corps at Boston University, and will commission as a second lieutenant in the Air Force upon her graduation in 2014. The strength, structure, openness, fluidity, and grace of movement in her classes represent the complimentary nature of her call to duty and call to practice. Kaitlin completed a 200-hour teacher training at Back Bay Yoga Studio in Boston and a 200-hour Forrest Yoga training with the creatrix of the practice, Ana Forrest. 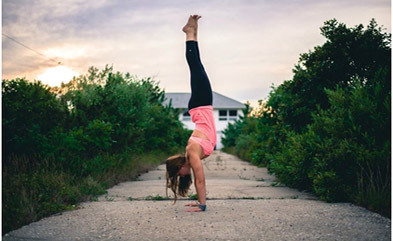 Her physical training as a part of the Air Force, combined with the muscular intelligence and fluidity of movement inherent in yoga, allows Kaitlin to teach intelligent and intense strength building alongside authentic connection to body, mind, and spirit. She is passionate about offering yoga as a healing practice, especially for military members as well as for those battling eating disorders, as a return to self love because of her own experiences. Kaitlin is forever devoted to her teachers Ame Wren, Ana Forrest, and Lynne Begier, and her mentors Aaron Cantor and Laura Ahrens. Yoga is... Connection. It’s the ability and the drive and the desire to get to the root of your very own being. Yoga is coming home to the person you really are, and being brave and strong enough to share that beauty, wisdom, and rawness with the entire world. I love yoga for what it has taught me about myself. I’ve learned to pay gratitude for my successes and to appreciate my flaws. Yoga has given me the best gift on earth by providing me with awareness of my own body. Knowing what feels good and what feels bad in my own skin and bones is a great tool on the mat, but has proven to be an even better one off. My first breakthrough yoga moment was when I kicked myself into a handstand for the first time, held it, and was able to breathe. I found myself finding more and more of these moments because I figured out how to find ease, no matter which pose I came into. I’ve learned how to relax and be comfortable in even the craziest of moments- because hey, isn’t that what life is all about? It’s just as simple as it is complex- yoga has made me better at living. Everything I do, I approach with intention. I’ve learned how to soften when I need to be soft and strengthen when I need to be strong. I try my best to live with ease, even when things are tough, and to never find myself stuck in any situation I don’t want to be in. Over the past several years, I’ve explored quite a few different movement practices. Instead of sticking with Vinyasa Yoga classes, which I was most comfortable with, I’ve stepped out of the realm of what I was used to by practicing with different teachers and different styles. I’ve trained with cross-fit and dance instructors, taken horseback riding and tai-chi, among lots of different disciplines. I take what I trust and value from other practices, and try to incorporate them into my own yoga practice and teachings. I’m inspired by the work of my teacher and friend Aaron Cantor. Aaron is the creator of Primal Practice, a system that works with movement with an inquiry-based approach. Through his teachings, I’ve become more comfortable with the idea of exploration. Instead of worrying about getting from point A to point B, I’ve become more interested in the creativity of how to get there. This practice has helped me to look at my yoga as a lifestyle, rather than just something I did a few hours a day. Instead of simply going from one task to the next, how can I live in a way that inspires me? How can I move and speak and listen and experience with intent and curiosity? Breath, breath, breath! Especially my own, but I often tune into the breathing of the other people around me. Yes, I love listening to some good music when I practice, but ultimately it’s the sounds of inhales and exhales that bring me back to the root, the core, that connection. Speak your truth, no matter what. Truth speaking is the journey of expressing yourself deeply, honestly, and compassionately. How often do we swallow our tongues and shy away from saying what we really feel? This practice is thrilling in that we drop whatever masks we’re hiding behind and expose our authentic selves to our entire universes.